Perfect for home and commercial use and can be used for ballet and barre fitness routines. Includes 8' barre, 3 mounting brackets, mounting hardware for wood stud walls, and an easy-to-follow mounting instruction sheet. The brackets can be placed anywhere along the barre length. 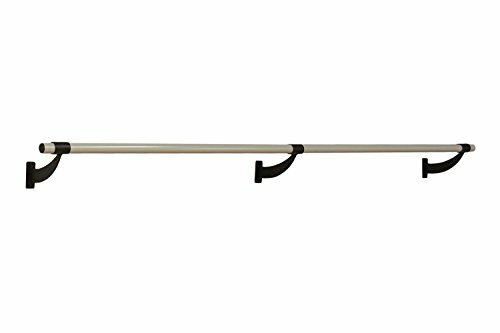 Vita Vibe 8 Foot Collared Aluminum Wall Mount Ballet Barre System is manufactured from heavy duty 1.5" diameter, .100" wall thickness aluminum. The aluminum barre features Vita Vibe's exclusive anti-microbial powdercoated satin silver finish which provides long lasting beauty and inhibits the growth and transmission of harmful microbes. Each barre end is finished with a black textured end-cap. The mounting brackets are manufactured from 1/4" thick steel and have a beautiful powdercoated texture matte black finish. The distance from the wall to the center of the barre is approximately 8"
View More In Ballet Equipment. If you have any questions about this product by Vita Vibe Wall Mount Ballet Barres, contact us by completing and submitting the form below. If you are looking for a specif part number, please include it with your message.